I have watched Dr. Charles Stanley on InTouch for years. His sermons are full of wisdom. With a genuine faith, he has a true heart for God. 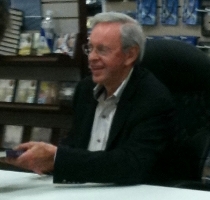 I got a chance to meet and talk briefly with Dr. Stanley when he visited my hometown this past week. As a writer myself, I wanted to know what kind of advice he would give me. As he was on a tight schedule and the lines were long to get his signed copy, “Turning the Tide” I knew he didn’t have a lot of time. Great advice from a best-selling author who has written over 35 books. Meeting the man taught me something about myself as well. I saw something in Dr. Stanley that was admirable. In his eyes, the Holy Spirit danced. I saw it. God’s love embraced this man and he was blessing others. If you have ever encountered what I’m talking about then you will understand. Even as a writer, it is hard to explain in simple words. When God anoints someone with His love, that love splashes out onto those nearby. All I can say is God loves Dr. Stanley. He has blessed him with wisdom. For if I can let God inside my heart like that, IMAGINE, the thought. What could I accomplish in my little world. Thank you God for Dr. Charles Stanley and the message he preaches. You are doing a good work in him and I saw it. A personal encounter with Dr. Charles Stanley. Full Story on Examiner. Your post intrigued me to find out more about Charles Stanley – certainly an interesting man. I agree with Mr. Stanley’s comment to you as a young writer – “diligence”. I would also add if I may -“believing in yourself and your ability”. Your posts are excellent, your writing should be continued! Thank you Words of Wisdom. Your encouraging words are something that I needed to hear. Yes meeting Charles Stanley was a momentous occasion for me. Thanks for sharing your thoughts. While I always respected Charles Stanley, I don’t think I’d like to meet him after experiencing the legal battles his ministries engage in. Dr. Stanley, I heard January 22,2012 message. I have let witnessing and placing tracts be a part of my life. So much was said in your message on witnessing to people. I believe it’s important that many examples, not just one, must be presented in your sermon for people to learn what to say. They don’t know because they haven’t heard lots of examples of what to say to sinners about their salvation experience. They need to hear many examples of witnessing to get it in their head so it will come natural that when they meet a sinner, they get on that person’s level as Paul taught and give their experience of that day when they themselves got saved.